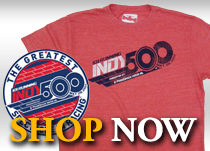 The Borg-Warner Trophy pays tribute to many of the most revered drivers in auto racing history year-round, but during the month of May it becomes the focal point for the drivers attempting to qualify for the Indianapolis 500 Mile Race. It is a reminder of the glory and tradition associated with winning the fabled event. With victory at the Indianapolis 500 comes the honor of having one’s face sculpted onto the 79-year-old trophy. Separate squares are affixed to its sterling-silver body, on which each winner’s face, name and winning year are permanently etched. A silversmith is commissioned each year to create the new champion’s portrait/sculpture in bas-relief for placement on the trophy. 2015 Indianapolis 500 winner Juan Pablo Montoya will see his second likeness revealed on the Borg-Warner Trophy at 5 p.m. on Wednesday, Dec. 9, at the Indianapolis Motor Speedway Hall of Fame Museum. Thank you for your submission. You will receive an email following the unveil containing the behind-the-scenes video of the Borg-Warner Trophy. The trophy was refurbished in 1992 and is valued at more than $1 million. Today, 101 faces grace the trophy’s squares. The faces date back to Ray Harroun, winner of the first Indianapolis 500 in 1911, and include two sets of dual victors (one driver started the race and the other finished it) for 1924 and 1941. Four-time champions A.J. Foyt (1961, ‘64, ‘67, ‘77), Al Unser (1970, ‘71, ‘78, ‘87) and Rick Mears (1979, ‘84, ‘88, ‘91) are the only drivers to have their faces appear more than three times on the trophy. Mears is the only one of those three to have a new likeness rendered for each of his four victories. Tom Sneva (1983) is the only champion who appears on the trophy wearing his eyeglasses, by his request. The last driver to have his likeness placed on the original trophy was Bobby Rahal in 1986, as all the squares had been filled. A new base was added in 1987, and it was filled to capacity following Gil de Ferran’s victory in 2003. For 2004, Borg-Warner commissioned a new base that will not be filled to capacity until 2034. Each May, the Borg-Warner Trophy is featured at a number of Indianapolis 500 events, including the public drivers’ meeting at the track, the 500 Festival Parade and the post-race Victory Celebration. Immediately after each race, the trophy is hoisted into Victory Circle with the winning car and driver for photographs. Besides displaying Indianapolis 500 champions, the trophy features a 24-karat gold head portrait of the late Speedway Owner and President Anton “Tony” Hulman Jr. in tribute to his rejuvenation of the track and the Indianapolis 500 after World War II. Hulman’s image was added in 1987.